[February 23, 2007] John Wesley Comstock Jr., 78, of Lincoln died Thursday, Feb. 22, 2007, at 9:14 p.m. at his home. A graveside service with military rites will be at 1:30 p.m. Thursday, March 1, at Zion Cemetery. 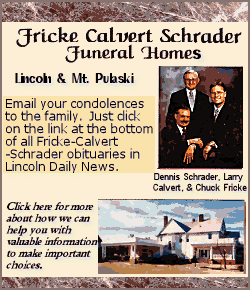 Arrangements are by Fricke-Calvert-Schrader Funeral Home in Lincoln. Mr. Comstock was the retired owner and operator of Comstock Bakery. He was born Aug. 10, 1928, in Atlanta to John Wesley and Caroline Brautigan Comstock Sr. He married Marthellen Dusenbery on April 9, 1950, in Lincoln. She preceded him in death Jan. 1, 1998. He is survived by three sons, Daniel (and Colleen) Comstock of Lincoln, David (and Lilly) Comstock of Albany, Ga., and Timothy (and Elizabeth) Comstock of Claremont, Fla.; one brother, William Burnell (and Edna) Comstock of Ranchero Cucamonga, Calif.; four grandchildren; and five stepgrandchildren. He was a member of First Cumberland Presbyterian Church of Lincoln, where he was an elder. He was also a member of American Legion Post 263. Memorials may be made to the Visiting Nurse Association Hospice Care of Illinois. Click here to send a note of condolence to the Comstock family.